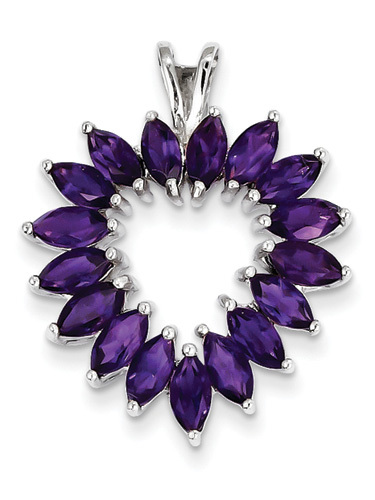 Marquis-cut genuine amethyst gemstones are prong-set in a .925 sterling silver heart pendant. The opened-backed amethyst gemstone heart pendant is then rhodium plated for a white shine that will last. The pendant fits up to a 4mm chain necklace (offered box chain is optional). Such wonderfully romantic heart jewelry with uniquely shaped amethyst gemstones makes the perfect gift! We guarantee our Marquis Amethyst Heart Pendant, Sterling Silver to be high quality, authentic jewelry, as described above.